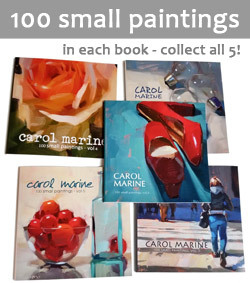 This Wednesday at 11am CST my husband and I will be interviewed on Artists Helping Artists, again. : ) This time we have a big announcement - one I think some of ya'll will be particularly interested in. I'll announce it here as well, after the show, but if you want to hear it sooner be sure to listen in. We've been working on it for months and I've been itching to scream it from the rooftops! Superb composition, lovely and lively painting! Can't wait to hear your news. Cutting edge I hope, like a cheese knife! Remember to smile and say "cheese." I love your cheese paintings!!! You make cheese so appealing I started to lurk at the cheese counter at the store. Now the cheese drawer in my reefer won't close. Next, the button on my pants won't either. By the time you guys get on the air, I'll have the 2nd bottle of wine open and half gone. Your show better be good, cuz I'm already fat, buzzed and happy. Nothing like e well-prepped fan base! 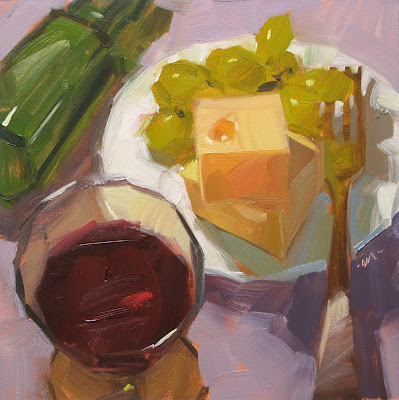 the cheese series its coming up very nice.. your painting are always an inspiration..
Well, it can't be a baby ,cause your drinking wine. Yup, like the cheese shapes; you get to sculpt! Forget the painting that is beyond fabulous- we want the scoop! Haha- know it will be great and can't wait to hear! And look at that shadow shaping of the cheese! Sigh...I want to paint that well! Thanks in advance for what will surely be amazing news! Loving this cheese series, the fork is wonderful as is the surface of the wine. Can't wait to hear the big news. Love the painting. Can't wait to find out the big secret! you just get better ad better dearest. Fresh, crisp, beautiful edges and fantastic drawing.